I am aware that our website is a very popular resource which constantly receives a lot of visits from parents/professionals, so I am always curious to see what types of information people are looking for and which are the most popular pages. 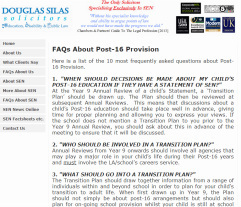 I have noticed in the past few months that there has been a lot of interest in our pages on FAQs on Secondary Transfers and FAQs on Post-16 Provision. I have also found that many people were interested in the ‘What Happens Now? (Post-16/Post-19 Provision)’ section in my last update. I have seen that we have received a lot of requests in the past few months for assistance with appeals from parents of children transferring from primary to secondary school. In the main, these have been against Statements of SEN that have been amended by the legally required date of 15 February. However, these ‘phase transfer’ cases have never covered young people transferring from secondary school to Post-16 education. There has never been a legal deadline for Statements to be amended ahead of Post-16 transfer (e.g. by 15 February). During the past few years, most LAs have still attempted to amend Statements by the middle of the academic year and the Tribunal has also given a shortened (i.e. 12-week) timetable to them to allow any appeals to still be heard before the end of the academic year so that everyone knows where the young person will be going/what provision they will be receiving, by September. This academic year, unfortunately, I have seen some LAs have delayed in issuing amended Statements for Post-16 cases (some even until around the start of the Summer term). This means that, even with a shortened Tribunal appeal timetable, the hearing of any appeal will now not take place until the Autumn of 2014. This effectively means that the young person concerned may not have an appropriate placement to go to in September 2014 (for example, the LA may be saying that the young person can go to a local College without a Statement, whereas the parents want them to go to/stay at an independent special school with a sixth form). I realise that from September 2014 and the new SEN Framework, all Colleges that offer FE will now be covered in the same way that Schools are at the moment in relation to SEN, but this does not really help those people stuck in the middle now! In fact, I was very concerned to see that one LA was arguably misleading parents. They were issuing ‘standard letters’ in January 2014 to parents of young people who were due to transfer to Post-16 education in September 2014. The letters stated that, unless the LA heard from the parents (i.e. they appealed) within two months of the date of that letter, the LA would automatically ‘cease’ to maintain the Statement in August 2014. It took me a few times to re-read the letter before even I worked out what was potentially happening ;and I like to think that I know what I am doing! Secondary/Post-16 transfers are getting a bit messy. I believe that there is a risk of even more confusion now in the next academic year now with the move to a new SEN framework. My best advice at the moment to parents of children/young people due to transfer to secondary/Post-16 education in September 2015, is to start preparing as soon as possible, particularly in Autumn 2014. This is also important since, if there are going to be any disputes, they need to get resolved as soon as possible. If this concerns you, please do not leave things until the last minute in Spring/Summer 2015.